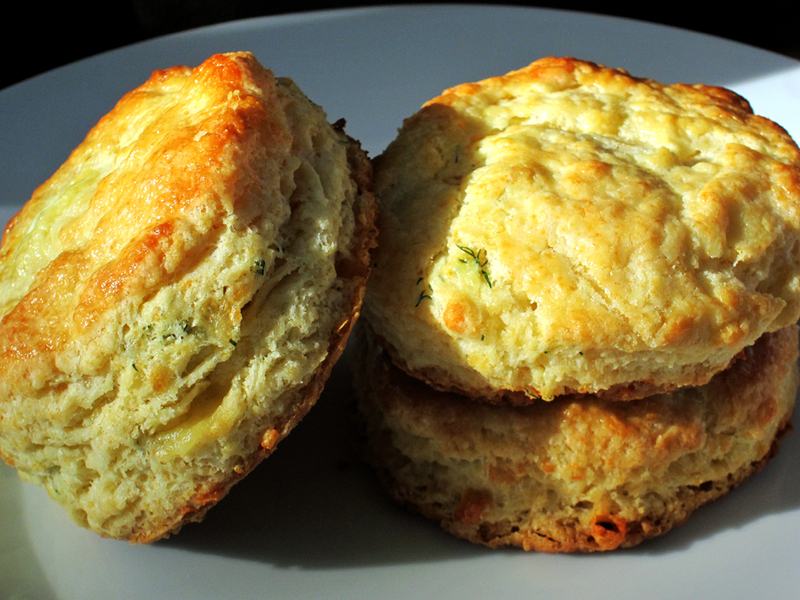 For tonight’s dinner I decided to make these wonderful scones. This is a fool proof recipe. Feel free to cut the recipe in half if you are just making it for two people. This recipe makes 16 large scones. Make sure that all of your ingredients (eggs, cream, butter) are super cold, otherwise you will end up with hockey pucks and not fluffy and light scones. Grate the cheddar cheese, chop dill, set aside. Combine 4 cups of flour, the baking powder, and salt in the bowl of an electric mixer fitted with a paddle attachment. Add the butter and mix on low speed until the butter is in pea-sized pieces. Mix the eggs and heavy cream right in the measuring cup and quickly add them to the flour-and-butter mixture. Combine until just blended. Toss together the Cheddar, dill, and 1 tablespoon of flour and add them to the dough. Mix until they are almost incorporated. Put the dough onto a well-floured surface and knead it for 1 minute, until the Cheddar and dill are well distributed. Roll the dough 3/4-inch thick. Cut into 4-inch squares or if you don’t have a cookie cutter, use a round glass, flip it upside down and press out the dough. Brush the tops with egg wash. Bake on a baking sheet lined with parchment paper for 15 to 20 minutes, until the outside is crusty and the inside is fully baked. Serve with any type of salad. Enjoy!